For the cynics who don’t believe the old adage, you are what you eat, let me tell you about my little accidental experiment. I say accidental because I didn’t really know that I was partaking in a self-inflicted health sabotage until about two weeks in – perhaps it should be called an unwitting experiment rather than an accidental one. Whatever: the results of my experiment are in. Eating crap makes you feel like crap. Now I didn’t go on one of those Supersize Me missions where people stop eating fruit and veg and only eat processed foods and drink coke; at first, my eating crap wasn’t even a daily occurrence. It was KFC one day and then perhaps a naughty little cocoa cola the next, fish and chips a couple of days after and perhaps something like a large slice of cheesecake the day after that. Not anything too shocking, but boy did I feel the effects. And then when I moved house and packed up my kitchen and basically had nothing to cook with – those two or three days were horrific! Burgers, fries, fizzy drinks, Twix bars on the run, petrol station “Cornish” pasties sat in the removals van… I was, by then, living in some kind of gastronomic purgatory. The effects of eating crap? It started with spots. Proper pustulous little blighters. It crept to my stomach – doughy, puffy, tender to the touch and altogether not functioning at all. It went on strike, I think, and decided to just process things when it felt like it, often at 3am or not at all. For days. The effects went back to my skin – dull, really greasy – and my hair, lank and greasy. My scalp itched. (Possibly some of these things were also stress-related, but I’ve been more stressed and seen less physical wreckage.) I don’t think that it’s a coincidence that I ate badly and my body began to fall apart; in fact the last time I’ve felt so unhealthy was on my Honeymoon when we drove through middle America for a week and ended up always grabbing fast food at highway service stations. (Bad, I know, but there were these huge lengths of road with NOTHING else in sight and when you haven’t eaten all day…) That time, like this time, I felt myself craving a simple tomato salad or some roasted vegetables or a fresh piece of fish with some kind of spicy salsa. Anything that had just been prepared from raw ingredients – chop-chop with a knife and straight into a pan. I only meant this post to be a little “aside” – I know that everyone these days is sick to the stomach of hearing about people’s diets and what they should and shouldn’t eat and how they should replace their bread with mung beans and their dairy with some kind of cheese made from a Yak’s blood. But I just thought that it was an interesting titbit. You eat crap and you most definitely feel it. Even if it’s not every day, it still takes its toll. I’m on home cooking (or at least excellent quality dining-out!) for the foreseeable future. 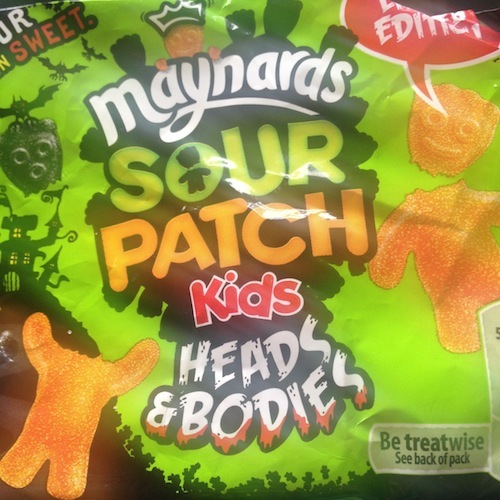 PS: those Maynard’s Sour Patch sweets in the photograph? Eaten two days ago. Couldn’t resist. That is definitely the last time and I am definitely on home cooking for the foreseeable future. Ahem. Previous Post Step Away from the Sale.